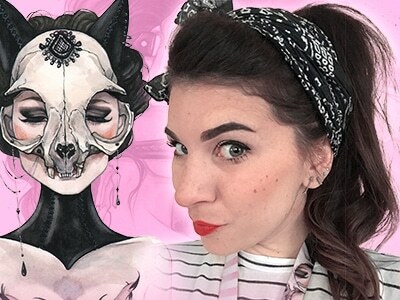 Carla Wyzgala, aka Carlations, traditional watercolor pin up illustrator of all things pretty ladies and Skull Masquerade, interlacing beauty with the bones of the beast. Co-creator and illustrator of Hidden Door Comics, watercolor fairytale graphic novels. Using vintage pin-ups and the art of burlesque as inspiration for an unapologetic balance between femininity and strength, her work is a celebration of the female form. Currently living in Long Beach, California.